Manual scavenging or the act of manually cleaning sewages and drainages is still practised widely in India. According to estimates, about 1,500 sewer workers lost their lives after 2013, from when manual scavenging was banned in the country. In India, it is also associated with the age-old practice of caste discrimination. A young startup from Kerala has found a solution to fight the evil, and improve the working conditions of sewer labourers. 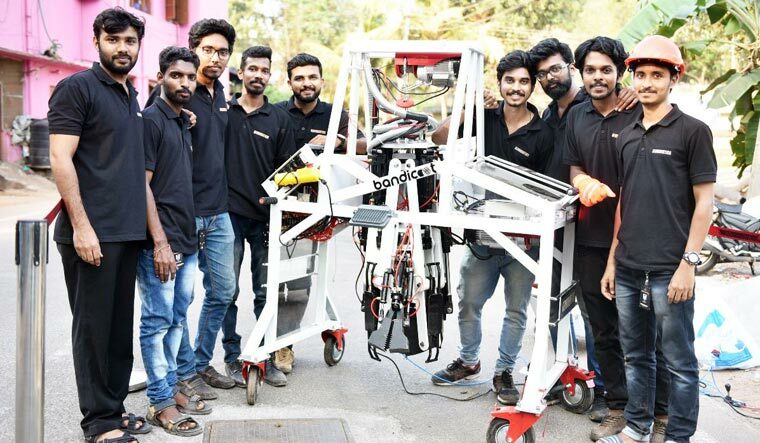 Genrobotics, founded by young engineering graduates, has developed a spider-shaped robot named Bandicoot to clean manholes. From opening the heavy cast iron lid of a manhole to collecting and clearing solid wastes, Bandicoot does everything that a labourer does inside a manhole. Once inserted, the robot's four legs attach on to the walls. The arm then scoops in the dirt and moves it to the attached bucket, which can be pulled out of the manhole. It can also set the sewer jetting pipes to clear drainage lines. “The robot has been designed in such a way that manual contact is reduced to the maximum extent possible,” said Nikhil N.P, a co-founders and chief technology officer at Genrobotics. The robot completed its maiden operation in the run-up to the popular Pongala festival in Thiruvananthapuram. The Kerala government officially launched the robot recently. One fine morning in November 2015, Kerala woke up to the tragic death of a 32-year-old autorickshaw driver Noushad and two sewer workers in Kozhikode. One among the latter had collapsed inside a manhole while performing maintenance work at a sewer; Noushad and the other worker lost their lives trying to save him. The tragic incident was soon forgotten. But four fresh graduates from MES College, Kuttippuram, in the state's Malappuram district—Vimal Govind M.K., Arun George, Nikhil and Rashid K.—were determined not to let the incident become another forgotten tragedy. They wanted to solve the problem of sewer-related deaths in India through their robotics startup. “Since the beginning, our focus was on solving socially relevant problems. We realised that sewer-related deaths were more than the number of deaths at the border,” said CEO Vimal. They commenced as a student startup in 2015 to provide technology solutions in defence using robotics, but that’s when Noushad’s tragedy caught their attention. They approached the Kerala Startup Mission with their intent to work in the area of sewage-related problems. “Upon research, we realised the glaring and inhumane conditions under which these men work. We told ourselves, 'Being engineers, if we are able to find a solution to this problem, then why not?' That's our way of giving back to the society,” said Arun, chief administrative officer. Currently, the team is nine-member strong. The four learnt that, despite its ban, one of the reasons why manual scavenging was still being practised was the ineffeciency of the existing machines. They merely assist manual scavenging but do not substitute the act of a man entering a manhole. These machines are not automated and do not collect solid wastes, the primary culprits for sewer blockages and flooded manholes. Typically, manual intervention is required to remove the solid wastes, including sanitary napkins, clothes and even electronic devices, that choke the sewer lines preventing water flow. “Even the engineers in the water authority department were desperate to find a solution to replace the practice of scavenging, but mechanisation was hardly any help. We started frequenting the department offices and they actively gave us insights into the real problems," Arun said. Genrobotics' immediate aim is to educate and equip the current manual scavengers to operate Bandicoot, so that automation doesn’t result in loss of livelihood. "Our immediate objective is to simplify the user interface and make it available in local languages so that the current labourers can easily operate it, and none of their jobs are affected," said Vimal. State governments, including those of Tamil Nadu, Karnataka and Maharashtra, have expressed interest in the company. However, the startup's current target is to introduce the robot in sewage divisions across Kerala, receive feedbacks and incorporate additional optimisations, if any, within the next six months. Then they would take it across India. The startup is also looking to collaborate with Swachh Bharat and Make in India to get an easy access across India to make the country manual scavenging-free, and convert manholes to 'roboholes'.